Editor’s note: Each ELCA Ethnic Specific and Multicultural Ministry has developed a mission strategy unique to its needs and aspirations. In this monthly series, we will feature the presidents of each ELCA Ethnic Specific and Multicultural Ministries association and highlight their work around cultural diversity and anti-racist action. Elected in 2017, El-Yateem assumed the post in part “to become the voice of the voiceless of the Arab and Middle Eastern church in the Middle East and to tell the story in the U.S. about their struggles, about their strong witness in very difficult situations in various countries in the Middle East,” he said. 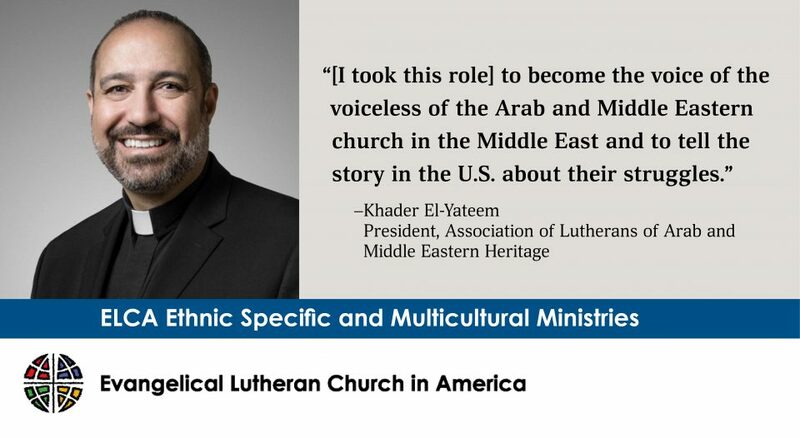 The association represents about 3,000 Arab and Middle Eastern Lutherans in the United States and has targeted Chicago, California, Florida and New York for growth, El-Yateem said. It includes two Arab and Middle Eastern ministries: Salam Arabic Lutheran Church in Brooklyn, N.Y., which El-Yateem founded 23 years ago and where he previously served as pastor, and Mother of the Savior Lutheran Church in Dearborn, Mich. Strengthening existing congregations—which can face challenges—is also a central focus. The association’s advocacy has been concentrated on helping immigrants and refugees from the Middle East and other countries. El-Yateem noted the importance of statements issued by ELCA Presiding Bishop Elizabeth Eaton on the Trump administration’s family separation policies, as well as the work ELCA Advocacy has done related to the issue. But he hopes to see such statements and advocacy prompt action in congregations. “My call to the whole church is to help our local congregations live out these statements in their daily lives in their relationships with their neighbors,” he said.